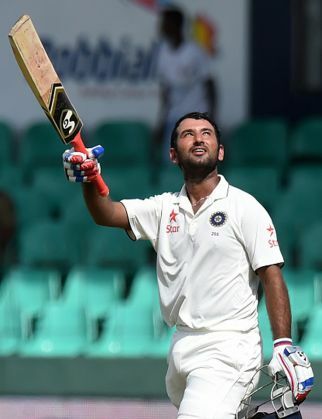 Cheteshwar Pujara marked his comeback with a gritty unbeaten century as India recovered from an early slump to reach a decent 292/8 in their first innings of the third and final cricket Test against Sri Lanka in Colombo on 29 August. The 27-year-old Pujara (135*) notched up his seventh Test century as he anchored the Indian innings brilliantly to take them to a respectable total after being reduced to 119/5 at one stage on an engrossing second day. Pujara found an able ally in tailender Amit Mishra (59) as the duo put on a resolute 104-run partnership, the highest eighth wicket stand on this ground, which allowed India to claw back into the game. Ishant Sharma (2) was giving Pujara company when stumps were drawn early because of rain and a wet outfield resulting in the loss more than 12 overs. Resuming at the overnight score of 50/2, India lost the wickets of captain Virat Kohli (18), Rohit Sharma (26), Stuart Binny (0), Naman Ojha (21) and Ravichandran Ashwin (5) in quick succession but Pujara and Mishra frustrated the hosts. For Sri Lanka, Dhammika Prasad (4 for 83) was the pick of the bowlers, while Nuwan Pradeep, Angelo Mathews Rangana Herath and Tharindu Kaushal chipped in with a wicket apiece. The first session clearly belonged to the hosts as they took two wickets for 69 runs and also claimed the honours in the second session by reducing India to 220/7. However, the visitors relied on Pujara's temperament and application to rebuild the innings while Mishra also showed that he was no pushover with the bat. Pujara hit 13 boundaries during his long vigil and made his comeback into the Test team a memorable one after a four- Test layoff. The day began 15 minutes early as stipulated for the remainder of this Test match, and the Sri Lankan bowlers were immediately on top. Dhammika and Pradeep got good purchase from the still- fresh pitch. The former looked especially threatening throughout the morning session and was really unlucky not to have picked up more wickets. He had two huge shouts for LBW against Virat Kohli (18) in the very first over of the day, and the first one a very close call, but umpire Nigel Llong did not accept the bowler's appeals. At the other end, Pradeep also made Pujara hop and skip as the ball took off from a good length, displaying the differentiating bounce in the pitch. India's scoring rate was very slow of course as it was a tough first hour's play, with only six runs coming off the first five overs. The Pujara-Kohli combine brought up their 50-partnership in the 23rd over, and then immediately Angelo Mathews (1/8) dismissed Kohli, who was caught behind chasing a wide ball outside the off-stump. Keeper Kusal Perera, who had dropped Kohli on 8 yesterday, did not make any mistake this time and gleefully accepted this chance. Rohit walked in to join Pujara at the other end as Rangana Herath (0/37) came on. He looked to attack the spinner immediately, going over the top a couple of occasions, and hitting him for a six as well. This positive intent rubbed off on Pujara as well and runs started flowing in the latter half of the session. The first hour of play yielded just 22 runs at the expense of one wicket in 15 overs. Playing with soft hands against pacers, Pujara opened up against the spinners as well, stepping out of the crease time and again. He was severe on Tharindu Kaushal (0/17) smacking three fours in his very first over as India crossed the 100-run mark in the 41st over. Two overs later, the Saurashtra batsman reached his half-century off 127 balls. Their 50-run partnership came off 117 balls as Kaushal was hit out of the attack after only a couple of overs. Prasad then returned for one last spell before the lunch break and got instant purchase from the pitch. Just when it appeared that the two Indian batsmen would go safely into the lunch break, Rohit went hard at an outswinger and edged the ball to first slip. Ashwin failed once again with the bat in what is proving to be a lean series by his standards. But Mishra then stuck around long enough to help push India's total past the 200-mark in the 70th over. The day was, however, all about Pujara, who batted at a strike-rate of 46.11 and gestured keenly towards the dressing room on reaching his hundred off 214 balls. This was his first Test hundred since scoring 153 at Johannesburg versus South Africa in December 2013, a gap of 22 innings. Pujara and Mishra continued to frustrate Sri Lanka in the post-tea session, furthering their 40-run partnership despite the second new ball being taken. Soon after resumption of play, they brought up their 50-partnership off 96 deliveries. The make-shift opening batsman than gave the opposition a first chance since yesterday, when on 117, he pulled one off Mathews (1-24) in the 88th over only for Pradeep (1-52) to drop it at long leg. Mishra then reached his third Test fifty off 71 balls in the next over. He went on to score the highest individual score by a number nine batsman at the SSC as well as putting on the record partnership at this ground with Pujara. Mishra was finally dismissed in the 93rd over, stumped off Herath (1-81) unaware that the ball had rolled to the keeper after an inside edge. Pujara, meanwhile, kept going at the other end in Ishant's company, before rain intervened for a second time in this match and stopped play. On a tough wicket, Pujara showed great discipline and patience, yet he never let the scoring rate down. Starting at 55 after lunch, he was looking for some company at the other end. But Binny was trapped first-ball after lunch by Dhammika for a golden duck. India were really struggling for breath at 119/5 then, but debutant Naman Ojha (21 runs, 54 balls, 3 fours) walked in to soothe the nerves. He mixed caution with aggression, but mainly Pujara upped the ante at the other end as the duo quickly put on 54 runs for the sixth wicket. They were looking in control, hitting the spinners easily and negotiating the pacers well too, but just then Ojha threw away his wicket trying to clear the fence in the 61st over by Tharindu Kaushal (1-45). The series is pegged at 1-1 after Sri Lanka won the first Test in Galle by 63 runs, and India came back with a 248-run win at the P Sara Oval in the second Test.